I finished Evan’s socks on Saturday. I got slowed down a bit this week as, at work, I rather unfortunately stabbed an 18-gauge needle into my finger. This gave me a good bruise and made knitting painful for a couple of days. He is very happy with them, but if I were to knit them again, I would go down to a size one needles rather than the twos I used, as the fabric is a bit loose. I would definitely knit with the Schaeffer Anne yarn again. I immediately cast-on a new pair of socks, as I thought my mother-in-law would appreciate a cute pair of stripey socks (her birthday was yesterday and she is visiting next week). I used some knitpicks yarn I bought way before I actually learned how to knit socks. I finished the first cuff as we were driving back and forth from Half Moon Bay. I thought I would try something different with the heel, as I didn’t think that the patterning of the yarn would mesh with the heel flap/gusset approach I typically use (typical being my first two pairs of socks). I attempted the afterthought heel, as described in “Sensational Knitted Socks.” Once I figured out the provisional cast on, I thought things were working out nicely, until I finished the heel and started on the instep/foot of the sock. There were huge holes on both sides. 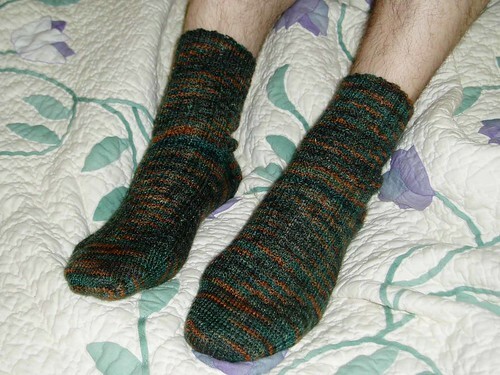 I have heard other people mention getting holes when they use some heel techniques, but I am not familar enough with sock knitting to figure how to avoid them. It could be because it is my first attempt with this technique. It could be fact that my provisional cast on was with slightly thicker yarn or that I used a rather solid stitch holder for the instep stitches while I worked the heel, both of which would make it more difficult for me to get the joins nice and snug. When I took out the provisional cast on, I was down a stitch, so maybe this is the result of that missing stitch? If you are a sock knitter and happen to be reading my blog, how do you avoid holes using the afterthought/forethought heel? 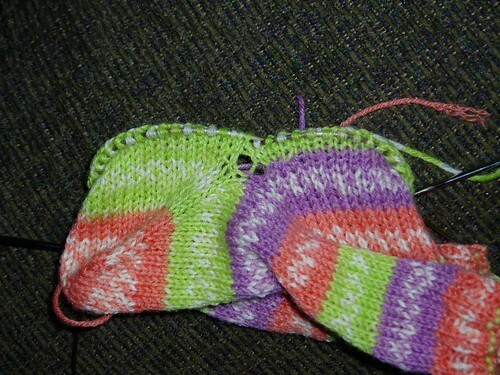 Also, what sort of heel do you typically use with these self-patterning yarns?